Starbucks Corp said Monday that the price gap between its drinks in China and the US is a result of different costs in the two markets and not because of unreasonable price setting. Starbucks charges 27 yuan ($4.42) for a Grande Latte (16 ounces) in China but the price for it in the US is about $3 including consumption tax, Shanghai-based China Business News reported Monday. Moreover, even the mug, which is made in China, is sold at a higher price in its China stores than in its US stores, the report said. The price of the Made-in-China mug is $10.90 in Starbucks in the US but about $16.36 in its stores in China, the report said. 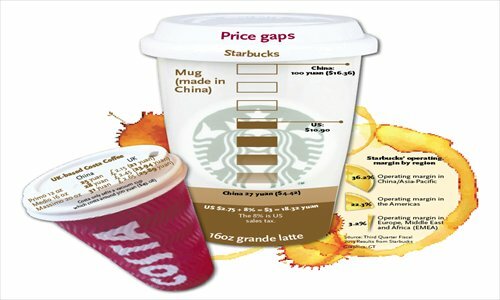 If the price gap on coffee can be attributed to transportation expenses and tariffs as Starbucks explained, the price gap on the mug shows that Starbucks seeks exorbitant profits in China, it said. The higher price in Chinese market is because "Starbucks is still in its early stages compared to the US," Starbucks told the Global Times Monday via e-mail. The expenses for Starbucks, including infrastructure investment, labor, commodity costs, currency valuation, real estate, reduces progressively with an increasing scale, the company said, noting its business scale in the US is different from China. Starbucks' business in the US is about 10 times bigger than in China, a staff member of the Public Relations for Starbucks who asked to remain anonymous told the Global Times Monday, noting the current costs in China are higher than in the US. "The price is decided on total cost," the PR staff member said. "It is not reasonable to compare a single product between two markets." 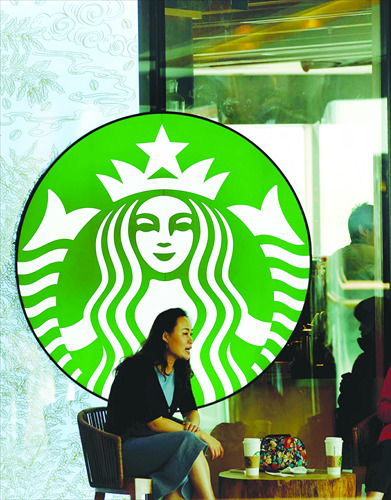 Starbucks has more than 1,000 stores in the Chinese mainland, according to its website. The fiscal report of the third quarter of 2013 on its website said the global operating margin is 16.4 percent and the operating margin in the Asia-Pacific market, which includes the Chinese mainland, is 36.2 percent. Sellers have the freedom to set prices for their products, Li Weihua, an expert from the Franchise Research Center of China University of Political Science and Law, told the Global Times Monday. In spite of costs, the set price of its products are also based on other factors such as brand strategy and market position, Li said, noting that as a leader in the Chinese coffee store market, Starbucks is capable of setting high prices. "I am not surprised by the price gap between China and the US," Li Xiaoxin, a customer, told the Global Times Monday, noting the products are always cheaper in their "birthplace" such as the iPhone, which is cheaper in the US than in Europe or China. "Compared with Starbucks, other cafes are not cheaper or even more expensive," Li said. A 16-ounce Latte at COSTA, a British café chain that also operates in China, costs 28 yuan. However, considering China has substantially reduced its tariffs since it became a member of the WTO in 2001, there is a possibility of price discrimination, Hong Tao, a director from School of Economics, Beijing Technology and Business University, told the Global Times Monday. After China lowered its tariffs, some foreign products have not become cheaper but instead have even become more expensive, such as cosmetics and cars, Hong said, suggesting investigations should be conducted on these high prices based on detailed surveys in order to protect Chinese customers.